Having a well-honed process is crucial to ensuring your customers have a great experience. From a warm greeting to timely shipment, missing the mark in service can tarnish customer perception of your brand. Identify which of your front stage activities would be better handled out of the customer's sight. One recent weekend I had the pleasure of watching a great performance staged by a local repertory company. It was a fun, engaging and surprisingly polished musical. Of course I may be a little biased, because one of the actors is a dear friend, but the performance really was amazing. The whole production--from my point of view--was flawless. Despite this seamless experience as a member of the audience, there was another reality that I never saw. Only because of my friendship with the insider do I know now that behind the scenes, chaos reigned. Costumes malfunctioned. People were running around half naked, and they were swearing, bumbling and tripping. Typical backstage antics of performing artists, I guess. But when that curtain went up, I had no idea what was transpiring backstage. As performers, this team was wired. All professional. All the time. No exceptions. I never saw them sweat. This got me to thinking: Isn't that kind of professional discipline equally important for any business that is focused on selling or delivering something to someone? And more specifically, shouldn't our tasting room and winery customers receive the same kind of "performance" from our businesses every time they interact with us? When guests enter your tasting room, and it's "show time" for your winery, how much have you and your employees practiced? How well do you know your lines? Know your stuff? Are you always ready when the curtain goes up? How often are your backstage activities inadvertently showing? In business education we are taught to divide our operations into "front stage" and "backstage" activities. This is not a new concept. Companies like Disney have used it for decades, and it works for businesses selling products, as well as those providing services. Simply put, the "front stage" consists of all the ways your company directly creates value for and interfaces with customers. And the "backstage" is everything that occurs beforehand (behind the scenes) in order for the front stage to be effective. Having a well-honed backstage process is critical to your company's ability to deliver a great front stage experience. Understanding how these activities divide is critical to success. Using the front stage/backstage lexicon helps. Mapping out the activities and their connections is even better. First, a simple rule of thumb: Front stage and backstage are separated by the "line of visibility." Anything that the customer sees (or hears) is a front stage activity. Everything else should be happening backstage. How can we make sure all of our front stage activities deliver a great brand experience? The secret lies in identifying which backstage activities support each and every front stage activity. Map it out. Pinpoint the weaknesses and address the gaps. This should be an ongoing process incorporated into team meetings and backed by management communication. The key questions are: Where is our backstage showing, and how can we make our backstage processes even better? Let's take a look at the backstage activities that reinforce the front stage experience of customers visiting an imaginary tasting room. The decision to visit our winery likely was preceded by some type of brand awareness--whether by our own marketing efforts or word-of-mouth. How effective are we at bringing new prospects and repeat customers through the door? Do we actively reach out to customers, and how do we measure the success of these efforts? The best way we can measure our marketing effectiveness is by asking visitors (on the phone, on the website or in person) how they heard about the winery or decided to visit today. Once we ask, the key is to track the results in a seamless, conversational way. Don't let your backstage show by exposing customers to your tracking system or process. What does our website say about us? Is it an accurate reflection of our brand promise and the on-site experience? What experience do our guests have when they call for directions or want to make a reservation? Is our receptionist a qualified "director of first impressions?" How easy is it to find the winery? Were verbal directions accurate? How is our website map? Our directional signage? How is our tasting room's "curb appeal?" Is there enough parking? Do the realities of our grounds and buildings fit our brand image? Our guests haven't even entered the tasting room yet, but our backstage is "showing" when any of these components isn't well handled. 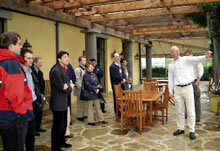 Now our guests are inside the winery, and it is clearly show time. How are they greeted? Are team members trained and able to welcome guests within seconds? Do we smile, introduce ourselves and call them by name? Do we ask open-ended questions to get the conversational ball rolling? Key information is needed so we can collect marketing data and tailor our offering accordingly. Guests tour the winery, cellar and vineyards at Sagaponack, N.Y.-based Wölffer Estate Vineyard, which offers tours by appointment. What is our plan for when things get really crowded? Do we have overflow staff we can tap? Can someone take a group on an impromptu mini-tour to relieve the pressure for a while? These are all backstage decisions that need to be made ahead of time. How do our guests decide what they want to do during their visit (tour, tasting, etc.)? What options do we have for them to choose from? Do we have an effective tasting menu design that encourages them to "trade up" to our higher end or more value-added tastings? Are our employees trained to assess preferences and tailor an experience that will delight? By tracking visitor conversion rates into these various activities we can learn how effective our backstage decisions are at "selling" various options to our guests. How do our guests enjoy the experience? Whether taking a tour, tasting or buying wine, do we exceed their expectations? Are our team members knowledgeable about the products, able to tell a compelling brand story, and educated and trained well enough to close the sale? Arranging to have someone we trust (and perhaps pay) to mystery shop our own winery on a regular basis will tell us honestly how we are doing here. Also, tracking sales and club member sign-ups by winery associate is an important part of the checks and balances. How easy was it to buy wine or join the club? Did we share all the relevant pricing, special promotions and club member benefits? Did we ring up the sale quickly and efficiently? Did we capture the customer contact information so we can follow up and build the relationship? Tracking conversion rates of visitors to club member sign-ups will help us monitor how effective our club-related backstage activities are. What are our guests' experiences after the visit? If we shipped, did they receive the right wine, on time and in good condition? Did we make appropriate follow-up calls? Anything less than a perfect customer experience in these final steps can be traced to a gap in our backstage process. 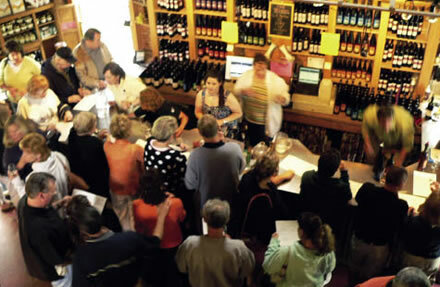 Having a plan for how to make customers feel included in a busy tasting room (such as this one at Round Barn Winery) is the key to turning visitors into satisfied buyers. Clearly, the backstage activities supporting our tasting rooms draw from all disciplines of the winery. From sales and marketing to hiring, training, operations, technology systems and accounting, everyone has a role to play in preparation for that opening curtain. Ask yourself what processes your company has in place to identify whether and where your backstage is showing. Start now. Identify at least one backstage improvement for each of your key front stage activities, and commit to shoring them up. An organizational culture that understands and actively manages front stage and backstage activities will, by definition, improve the customer experience. Align your company's backstage support structures with the front stage experiences you provide for customers. By doing so, you can improve organizational clarity and direction, and make sure that your brand message is consistently and seamlessly delivered. All professional. All the time. No excuses. Lesley Berglund is an accomplished wine industry entrepreneur, CEO, board member and change agent. As co-founder of the Ambrosia Wine Catalogue/the Winetasting Network, she gained deep experience in the wine industry and in consumer direct marketing. As co-founder and chairman of the WISE Academy (Wine Industry Sales Education), she is dedicated to raising the bar and accelerating careers for wine industry direct-to-consumer marketing and sales professionals. Learn more at wineindustrysaleseducation.com. To comment on this column, e-mail edit@winesandvines.com.